Millions of Americans suffer from symptoms associated with chronic sinusitis, an inflammation or swelling of the tissue lining the sinuses. At Orange Coast ENT Head & Neck Surgery, we are one of the few offices in Orange County that offers in office Balloon Sinuplasty™ procedures, a surgical treatment of blocked sinuses. If you have been diagnosed with chronic sinusitis and are not responding well to antibiotics, you may be a candidate for surgery. With Balloon Sinuplasty™, you now have a less invasive option that is clinically proven to be safe and effective, and can improve the quality of your life. Balloon Sinuplasty™ devices provide an endoscopic, catheter-based system for patients suffering from sinusitis. Recently published data in the leading ENT journal shows that the technology is safe and effective: study participants experienced no adverse events and received significant relief from their symptoms. Balloon sinus dilation keeps sinus passages open, offering long-term relief from the problems associated with sinusitis. Multiple studies show patients experienced less facial pain, improved sleep, less use of antibiotics, fewer visits to the doctor, and were more able to perform day-to-day activities at home and work. Balloon sinus dilations can be performed at our offices and a typical procedure lasts less than 45 minutes. Many patients resume normal activities the same day. Depending on your insurance coverage, the in-office procedure may reduce the procedure costs you pay. After local anesthesia to numb your sinus tissue, our highly trained physicians Dr. Pettis will insert and gently inflate the balloon to dilate the treatment area. 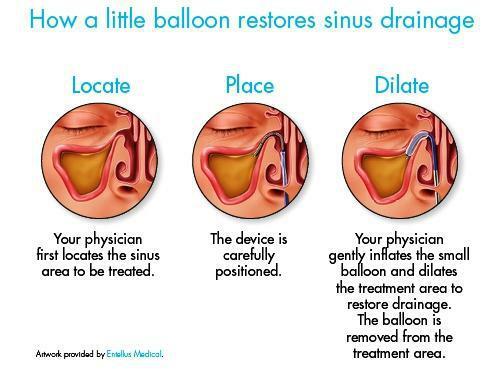 The balloon dilation expands the sinus pathways to restore drainage. After five seconds, the balloon is deflated and removed. In chronic and recurrent sinusitis, blocked sinus drainage pathways can prevent effective drainage and healing. When first line medication therapies fail to resolve symptoms and inflammation or patients experience multiple bouts of sinusitis, balloon sinus dilation may be an appropriate treatment option. Procedure length is dependent on your specific condition and anatomy. You should expect to spend around one and a half to two hours at the office, to allow time for pretreatment preparation and post-treatment examination. Consult your physician to better understand the details of your procedure. 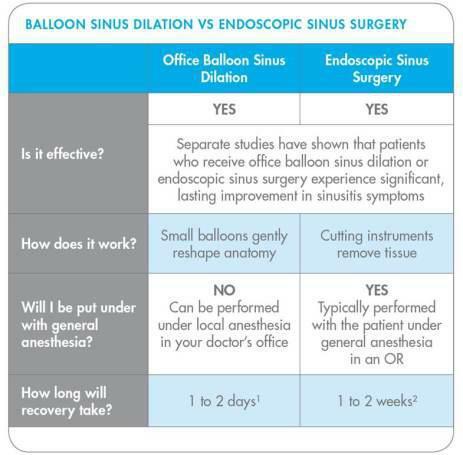 For more information on balloon sinus dilation or office based sinus treatments, visit www.SinusSurgeryOptions.com.